This week was my first time using the Happy Herbivore meal plan (all vegan, oil free, whole foods based) exactly as intended. The idea is that she provides a meal plan (for every meal for a week, including snacks) that gives you around 1,200 calories a day. You also get a shopping list, recipes, and prep plan. The prep is meant to take about two hours and sets you up for the WHOLE WEEK. It took me four hours and thirteen minutes, including cleaning the kitchen. I think I will get faster with practice. It’s a little crazy cooking several meals at once time, and I wasn’t really ready for this level of multitasking. Three to four dishes at once was the most I could pull off. The prep plan was so cool- she tells you what grains to start (like rice and pasta) and what to do with each veggie. Once you start cooking you have everything ready for every dish! 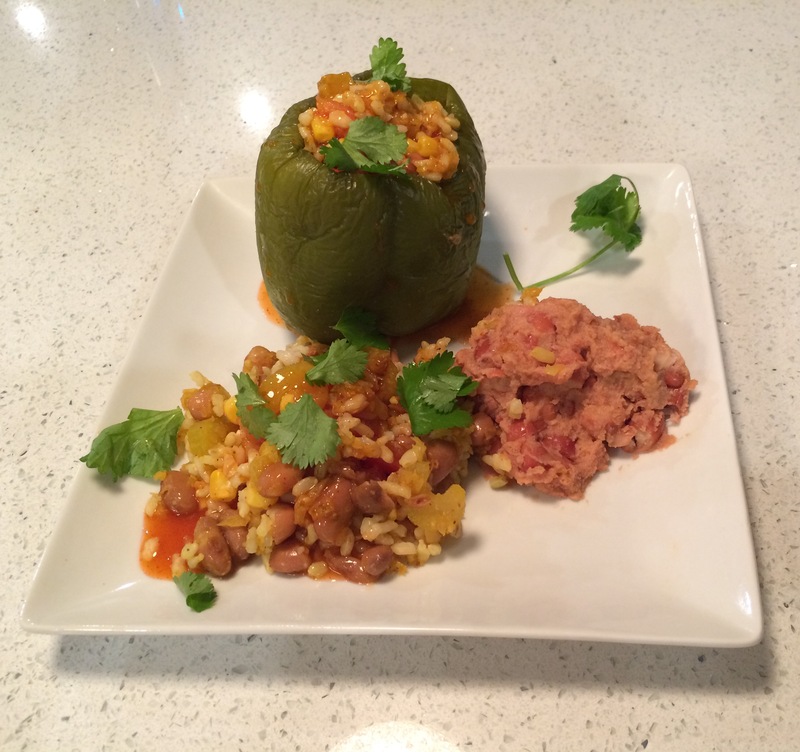 The meal pictured is the Stuffed Bell Pepper. The one I did this week had me making all meals except for a few quick breakfasts that I put together on the go. I was very skeptical of this idea, worrying that the food would go bad. I’ve previously just made the meals every day. However, a huge stumbling block for me is eating whatever I can find that is ready to go when I’m hungry. This results in eating french fries at work, chip type snacks or cookies at home, anything I can find and it is always unhealthy. Having healthy food ready to go is incredible! My weigh in has me at a gain of one pound. So, that brings me to 3.2 pounds lost in two weeks. I wish I had actually lost this week, but I actually feel really good about using the meal plans. I can’t blame them, since I have been eating extra snacks and it’s also every woman’s favorite time of the month. I’m worried that I will lose stamina on spending a huge block of time on the weekends cooking everything, but it was so beneficial this week and I’m hoping I’ll be able to remember that when I’m feeling lazy. It saves so much time during my crazy work week, and definitely helped me avoid junk food. Now I just need to stay stronger! Next week I have my first personal training session at the Diva Den (I got a great deal on a three session package on Black Friday), and I am excited to see how it goes. I already had the consultation and I loved my trainer. We had a great talk about how I do have a big weight loss goal, but my end game is to be thin, toned, and strong. My focus needs to be to stop eating anything that isn’t on the plan, but it is almost my birthday and I think that the rest of this week will bring challenges on that front. I have been asked if I will post before and after pictures. I’m considering the yellow dress picture in this post my before picture, and I will post some photos along the way as the loss becomes noticeable. Here is my journal link if anyone wants to check it! Two easy steps you can take to help with snacking is drink lots of water and consume protein. Both help you feel more full. I’m not even doing it because I’m hungry, I’m doing it because I am addicted to eating random junk food. I do drink a ton of water, but I think this is a good point. I will try harder to always have my water bottle! I had to quit snacks altogether. I only eat three meals a day with balf portions. At age 62 , i lost 70+ pounds with Gods help. You are doing great and that food looks yummy!!! Yeah, Ive been taking pics regularly but decided only to post monthly to see changes. You make me laugh by counting the prep time. How much time do you think it saving you during the week? That photo cannot be your before photo are you *** kidding! Nobody looks good in a bridesmaid dress and please don’t even get me started on how that color does nothing for your skin tone or how no woman wears their hair in a updo. That photo has one purpose- to make the bride shine! You need a real photo of yourself if you wish to be inspired! Well, I don’t really know how much time I spend. I imagine I am saving about 30 minutes a day, plus the drama of deciding what I want for dinner. I should add in another 45 minutes for the second shopping trip I usually make, so at this point I am about breaking even on time. However, I’m also saving myself from eating out for lunch when I don’t have anything to bring with me. Okay, I guess I need a new before picture. The problem is I delete all terrible pictures of me (which is almost all pictures). That looks delicious! Nice work with all that prep. It probably overall saves time? I’m super proud of you. Ps a trick I had for not snacking was to chew gum. Does that work for you?